We’d love your help. Let us know what’s wrong with this preview of Bitterroot by Susan Devan Harness. In Bitterroot Susan Devan Harness traces her journey to understand the complexities and struggles of being an American Indian child adopted by a white couple and living in the rural American West. When Harness was fifteen years old, she questioned her adoptive father about her “real” parents. He replied that they had died in a car accident not long after she was born—excep In Bitterroot Susan Devan Harness traces her journey to understand the complexities and struggles of being an American Indian child adopted by a white couple and living in the rural American West. When Harness was fifteen years old, she questioned her adoptive father about her “real” parents. He replied that they had died in a car accident not long after she was born—except they hadn’t, as Harness would learn in a conversation with a social worker a few years later. To ask other readers questions about Bitterroot, please sign up. This book was illuminating, heartbreaking, and hopeful. I bought it because I heard an interview with the author on Colorado Public Radio and I'm so glad I did. The author provides an honest and vulnerable account of being adopted by a white family out and how that affected her coming to terms with her Native American heritage. I recommend this book if you're looking for something to challenge you, make you see things in a different way, if you're a history buff, or if you simply want to learn m This book was illuminating, heartbreaking, and hopeful. I bought it because I heard an interview with the author on Colorado Public Radio and I'm so glad I did. The author provides an honest and vulnerable account of being adopted by a white family out and how that affected her coming to terms with her Native American heritage. This is a wonderfully written memoir of a woman's journey to find her roots in a Native American world after being adopted as a young child by a white couple. The author's descriptive writing takes you into her world and you feel the pain she endured as she completed this journey. Wonderful book! Excellent. Gripping, spellbinding, and true. Interesting book providing insight into transracial adoption from the often overlooked perspective of the adoptee. 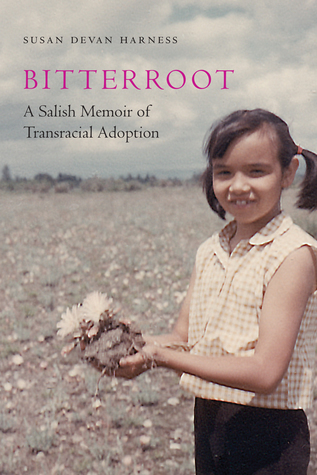 Susan Devan Harness, author of Bitterroot: A Salish Memoir of Transracial Adoption (University of Nebraska Press, October 1, 2018) is a member of the Confederated Salish Kootenai Tribes. She is a writer, a lecturer, a cultural anthropologist and oral historian. She received her Bachelor’s degree in Anthropology from the University of Montana and holds two Master’s degrees, one in Cultural Anthropo Susan Devan Harness, author of Bitterroot: A Salish Memoir of Transracial Adoption (University of Nebraska Press, October 1, 2018) is a member of the Confederated Salish Kootenai Tribes. She is a writer, a lecturer, a cultural anthropologist and oral historian. She received her Bachelor’s degree in Anthropology from the University of Montana and holds two Master’s degrees, one in Cultural Anthropology and one in Creative Nonfiction Writing, both from Colorado State University.